This class teaches the fundamentals of karate as well as an age appropriate cardio/strength building workout. Children learn respect and discipline as they continue to hone their skills. Bozeman Karate has developed a special program to help your child develop coordination and balance, overcoming any awkwardness or imbalance during the growth years, while building confidence in many areas. Respect, self-discipline and courtesy are emphasized throughout the program to support values taught at home and school. We help kids learn to focus. We offer team competition, training and coaching. Bozeman Karate's program will help your child develop the ability to stand up to peer pressure and other intimidating situations. The result is a self-confident child who does not need to compromise his/her correct choices, be a bully, or show off to others. Our Kids’ program is structured yet it incorporates good, clean fun and is a great way to burn off energy. 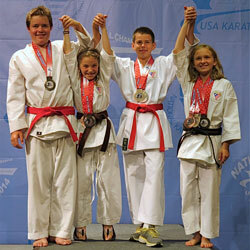 We at Bozeman Karate firmly believe in the values of our karate program and its life-long benefits. While our regular Childrens Karate class focuses on the teaching of traditional Okinawan karate and its fundamentals, we offer a separate optional sparring class that is available to students once they have attained the level of Orange belt.